Just like in the real world, sometimes it is best to send in the clone to do the dirty work. Recon has been given a bad rep as a card that eases face-checking, since its jack out clause is best aimed at an unrezzed Archer. However, it's best played as an alternate Forged Activation Orders. Both FAO and Recon only work as an effective decision fork if you are threatening to break whatever other ice is on the server. Both have as one side of the fork "Pay to rez this ice without it going off" and, as the other side, "the runner gets in." However, the two cards threaten slightly differently. While FAO can threaten a future run event, like Account Siphon, Recon can only threaten what would trigger on a successful run. For this reason, Recon works best with cards that passively boost successful runs, like HQ Interface, John Masanori, or Security Testing. Just be sure to have the time and money to deal with any consequences of jacking out. Another way to look at this card is as a way to retain resources. 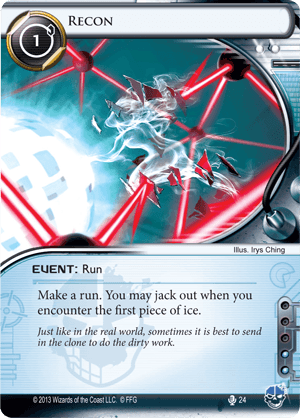 An Overmind with a few counters on it lets you run safely at a lot of things, but an unrezzed Komainu or Information Overload could deplete the Overmind's counters while hurting the runner. Running with Recon either forces the corp to expose the surprise, or let the runner play the single access lottery. Cerebral Imaging: Infinite Frontiers will likely find this type of bargain painful. In addition, resources like Zona Sul Shipping and Rachel Beckman, which trash themselves if the runner is tagged, would benefit from the extra protection against a Hunter. At the date of this review, there still isn't enough to recommend this card just yet on its own merits. Its synergy with the Ken "Express" Tenma: Disappeared Clone ID might make it worthwhile, as with Public Terminal it's the same as clicking for a credit and running with the next click--but the same could be said of Early Bird, with a better click advantage. That said, the game could easily move in a direction where passive run enhancements beat aggressive Legworks, and protection of assets becomes a vital part of the late game strategy.